I came across this amazing poem, and have not been able to get it out of my head since. In just a few short words, the writer is able to combat every excuse I have that is ruled by fear. Fear is what lies behind every opportunity we let slip by, every chance we didn’t take. The fear of failure- the fear of falling is what we let decide our fate. But, what if we didn’t look at it with the negative twist of fear. 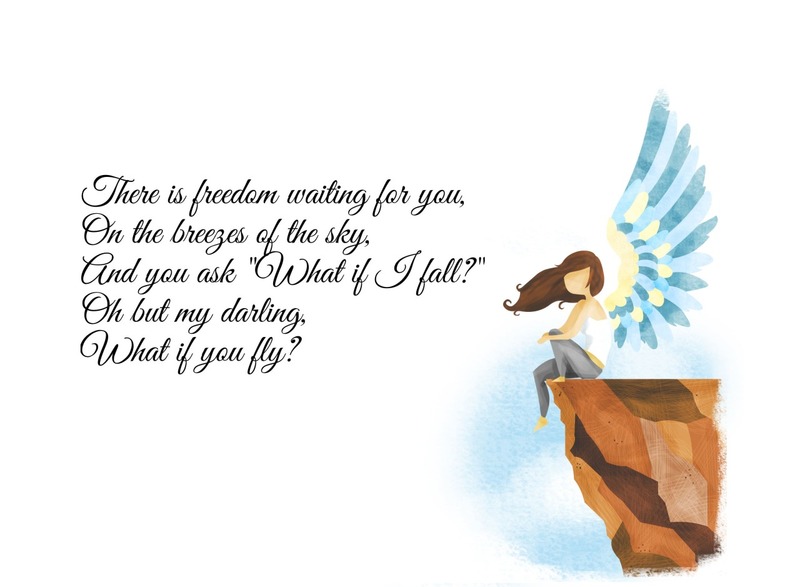 What if instead of asking “What if I fall” we ask “What if I fly”? How amazing could that be? What if we decide not to play it safe. In my short 25 years of life, I’ve been straddling the line of fear and flying. I have this value of financial security- a need to ensure all my bases are covered, and I never have to worry. The voice in my head that says “don’t”, “should” and “can’t. And then I have another value. One that involves independence and freedom. This value is the one that makes my heart flutter and gives my stomach butterflies just when I write about it. It’s the one that excites me and brings life to my eyes. When I let go of my fears, I left all that I knew behind to travelÂ andÂ live in Australia. I fell in love. I went skydiving. When I asked “What if I fly?”. I let myself take out a ridiculously high interest loan to start my life coach training. I made a life I am passionate about. When I set my fears aside, I feel that freedom- that joy life has to offer.